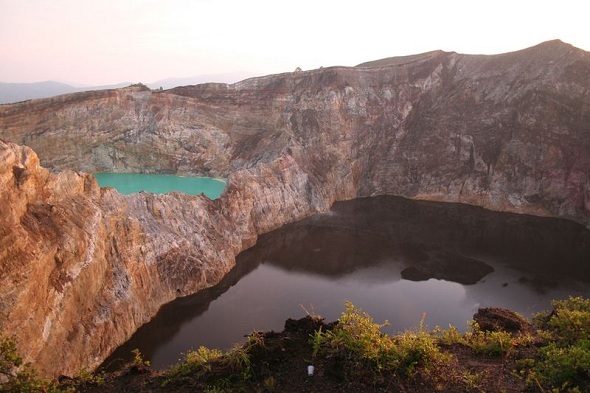 Indonesia is one of the world’s most geologically active countries. Given its combination of active volcanism and tropical climate, it is home to several volcanoes which exemplify the type of dynamic interactions between the forces of the endosphere and exosphere that are characteristic of volcanic lake environments. Of all the volcanos in Indonesia, Keli Mutu on the island of Flores appears to have the most exotic lakes. In fact, its lakes are so brightly colored that they are featured on the 5,000 rupiah bill and thought of as a national treasure by the people of Indonesia.